Dan Jackson, commander of the Veterans Warrior Society, follows the flags during the grand entry. 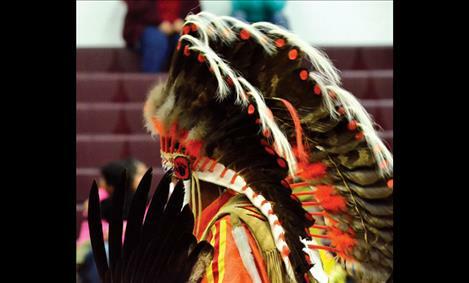 Many showed up to dance in full regalia and honor veterans. PABLO – Francis Stanger, 87, is one of the last dozen or so World War II Veterans in Lake County. He enlisted in the Marine Corps when he was 17. He served from 1945 to 1947. He remembers being stationed in North China near the China Wall and seeing plenty of combat. During one mission, he remembers telling the men with him to “keep still or you will give our position away” to the enemy, and the crew gave him a name that mixed a bit of authority and his Salish and Pend d’Oreille heritage. “They would call me chief,” he sßaid of the nickname. He said he wasn’t a chief, but he didn’t mind the friendly name. 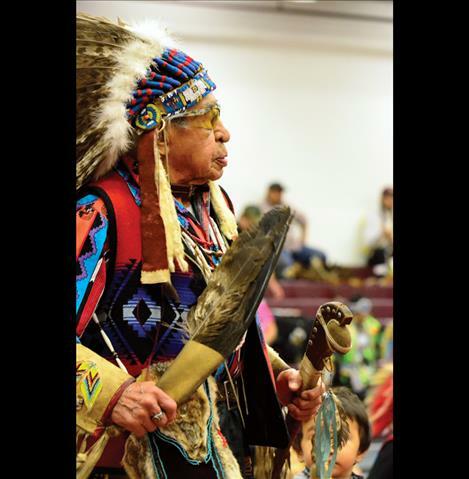 Last weekend he attended a two-day powwow at Salish Kootenai College, hosted by the Confederated Salish and Kootenai Tribe’s Veteran Warrior Society. 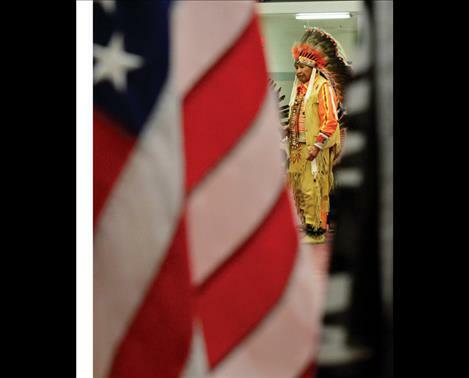 On Friday, he put on his regalia and stood with several other veterans as they were honored after the grand entry. Each veteran said their name and branch of service. The entire group had about 100 years of combined military service. The group was made up of mostly men. Bobbie Orr was one of the few women in the group. She served in the Women’s Army Corps during the Vietnam era. Lailani Upham, who also attended the event, served in the Army during the Gulf War era. She was busy taking photos so she didn’t stand with the veterans. She comes from a long list of service people in her family and says that it’s important to support veterans. 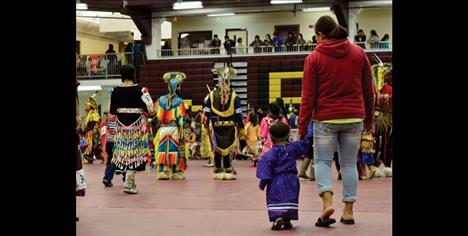 This is the 23rd year for the Veteran Warrior Society Powwow. 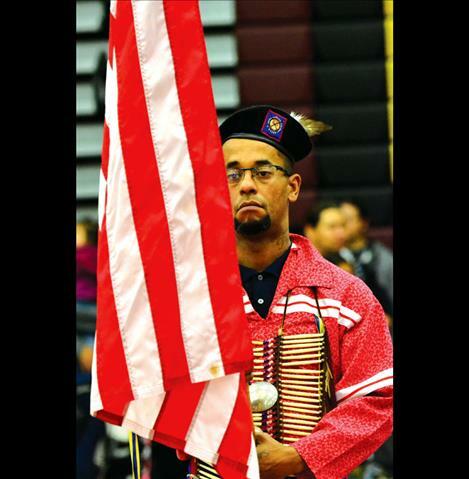 Tribal veterans are automatically inducted into the group once they become veterans. Although, any veteran can join the group. 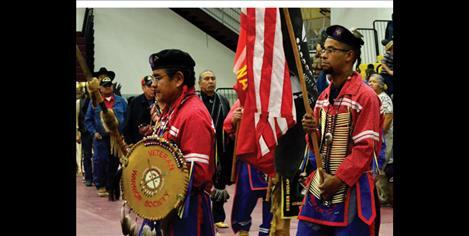 “We invite any culture,” said Dan Jackson, Veteran Warrior Society commander. Many of the Warrior Society members wore a breach cloth with the group’s emblem. It consists of a crossed spear and rifle, seven feathers along the bottom and the name of the group across the top. Two red handprints next to a rainbow symbolize the crazy dogs. So, the group took on the symbol to identify themselves as a group that provides support for veterans. They attend funerals, memorials and many other events. “For the most part, we watch over each other,” he said.